See what people are saying about Penny. The Chef: It’s always fun to talk with Penelope Williams or as we all call her, Penny. She’s very bubbly, incredibly sweet and definitely full of smiles. 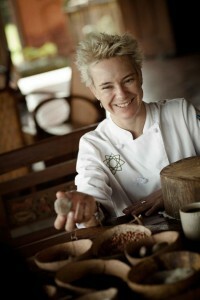 And all that positivity radiates much into her works as the owner and Executive Chef of Bali Asli. Penny and Bali Asli featured in the Channel 7 TV series Luxury Escapes. The presenter is Shane Jolly and the episode started at Bali Asli and continued with an adventure on a vintage Vespa scooter, a visit to a local temple and finished with a picnic lunch at the water palace. Go to the “In the Press” page to view three video clips of the episode. Bali Asli combines serendipity and vision in a unique recipe created by Executive Chef and Director, Penelope Williams; “Bali Asli is the product of my many dreams. A spark inside me was ignited when I went travelling through Asia in the late 1980‘s, little did I know the spark would lead me to where I am now. After a four-year apprenticeship at the Savoy hotel in London, where I didn’t see a fresh chilli for the entire period, lots of foie gras, and truffles, but no chilli! It then took 12 years in Sydney working in cutting edge restaurants such as Restaurant 41, Boathouse and Bather’s Pavilion, followed by a three-year posting as Executive Chef at the Alila Manggis hotel East Bali, for me to realise my dream. During my time at Alila I fell in love with the amazing freshness and vitality of the produce available at my door step and the way the Balinese work with it to create a unique tapestry of flavours. I truly believe that I am in Bali for a reason, I’m not yet really sure what it is exactly, but I believe that Bali Asli is part of it.” How lucky am I to have my dreams come true? 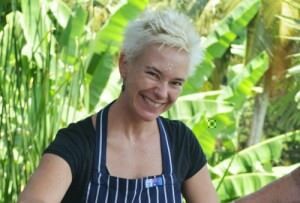 In our search for enthusiastic hosts in Bali, Aussie chef Penelope Williams stands out from the crowd. 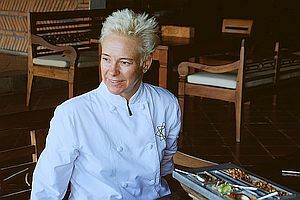 After just six years on the island, three of which she spent as Executive Chef of the ultra-luxe resort Alila Manggis, “Penny” has lovingly created a close-knit community in East Bali that celebrates authentic Balinese culture and cuisine. To see the full interview, go to ‘Govoyagin’ website.